To de-provision a user’s Syncplicity account, you can disable or delete it. You may wish to disable a user’s account if the user is on an extended leave of absence and expected to return. While disabled, the user cannot log in. The account cannot be reinstated. If necessary, you would need to create a new account for the user. The folders and files owned by the users are deleted. The user’s shared links and shared folders are no longer accessible. Before deleting an account, you should review all the user’s folders and change ownership of those folders you wish to retain. 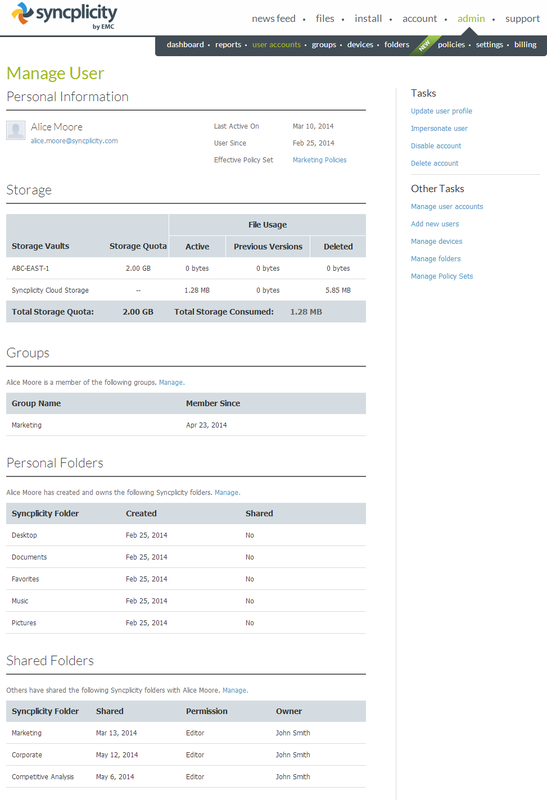 Refer to the Manage folder ownership and permissions article for the procedure. You may also wish to delete the files on the user’s device using the remote wipe feature, as described in the Remote wipe policies article. To disable or delete an account, click admin then click user accounts. In the Manage Users page, click on the user whose account you wish to disable or delete. You can use the Search feature if there is a long list of users. On the right side of the Manage User page, in the Tasks section, click the Disable account or Delete account link. If disabling an account, you are prompted to confirm the action. Once you confirm, the account is disabled and the user cannot log in. In the Manage Users page, the user’s has a Last Activity of disabled. If deleting an account, you are prompted to confirm the action and cautioned about deleting files owned by the user. You need to check the box to ensure that the delete action is not done hastily. Once deleted, the user account is removed from the Manage Users page.